The Higgs boson, or the "God particle," which was discovered last year, garnered two physicists the Nobel Prize in physics on Tuesday, but it didn't go to the scientists who detected it. Junior Seau committed suicide May 2 in his Oceanside, California, home. 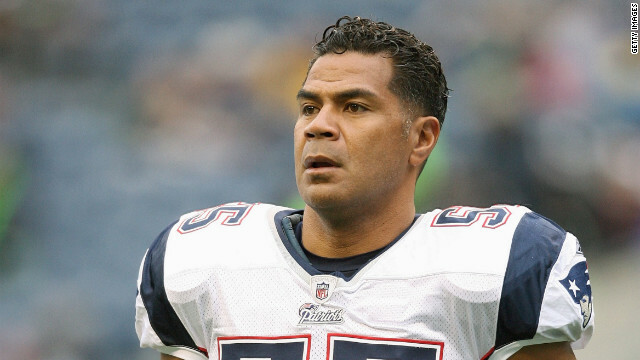 A deeper examination of the late NFL linebacker Junior Seau's brain suggests he had traumatic brain disease after all, the National Institutes of Health says. An examination suggests Seau had the brain disease chronic traumatic encephalopathy, the NIH said Thursday. "On initial examination the brain looked normal but under the microscope, with the use of special staining techniques, abnormalities were found that are consistent with a form of chronic traumatic encephalopathy," the NIH said in a statement. There was also a small part of his brain with "evidence of scarring that is consistent with a small, old, traumatic brain injury," the NIH said. Seau's May 2012 death was classified as a suicide. In August, an autopsy showed no apparent signs of damage. Earthquake experts around the world say they are appalled by an Italian court's decision to convict six scientists on manslaughter charges for failing to predict the deadly quake that devastated the city of L'Aquila. They warned the ruling could severely harm future scientific research. The court in L'Aquila sentenced the scientists and a government official Monday to six years in prison, ruling that they didn't accurately communicate the risk of the earthquake in 2009 that killed more than 300 people. The trial centered on a meeting a week before the 6.3-magnitude quake struck. 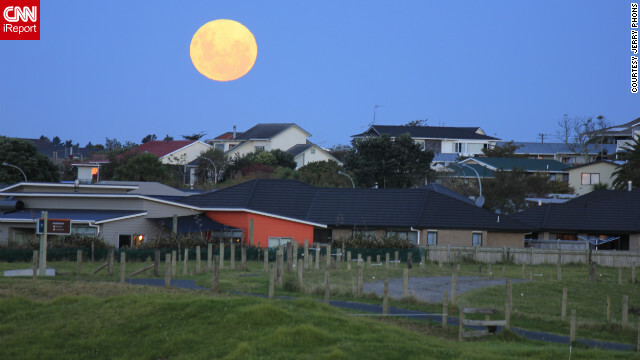 At the meeting, the experts determined that it was "unlikely" but not impossible that a major quake would take place, despite concern among the city's residents over recent seismic activity. Keith Campbell, the scientist who helped pioneer the birth of Dolly the sheep, the world's first mammal cloned from fully developed adult cells, has died, according to The University of Nottingham. Campbell, 58, died on October 5, according to a university statement released Thursday. His funeral has been scheduled for October 24. The university did not say how he died. Campbell was part of a team at the Roslin Institute near Edinburgh, Scotland, that cloned Dolly in 1996. 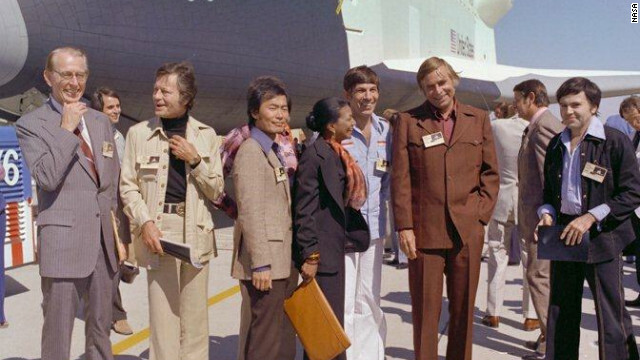 Her birth made headlines worldwide, capturing the scientific imagination of many while generating intense controversy over the ethics of cloning. 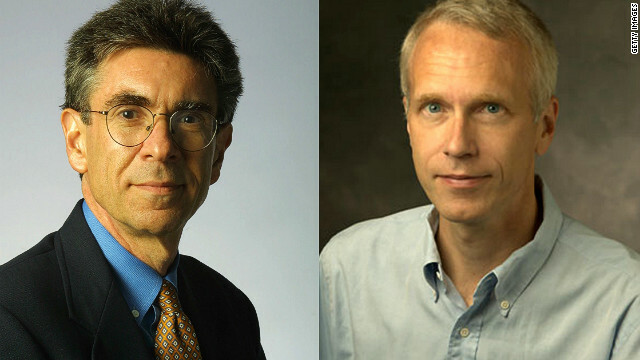 Research by Robert J. Lefkowitz (L) and Brian K. Kobilka (R) on have increased understanding of how cells sense chemicals. Over four decades of research by Robert J. Lefkowitz and Brian K. Kobilka on "G-protein-coupled receptors," have increased understanding of how cells sense chemicals in the bloodstream, according to the Royal Swedish Academy of Sciences, which awarded the prize. "I'm feeling very, very excited," Lefkowitz said in a predawn phone call from the United States to the committee in Stockholm, Sweden. The announcement caught him by surprise. "Did I even have any inkling that it was coming?" he said. "I'd have to say no." Early data shows the Mars rover Curiosity landed with amazing accuracy this week, coming down about 1.5 miles from its target after a 350-million-mile journey, NASA scientists said Friday, perhaps giving planners more confidence about landing spacecraft in tight spaces in the future. 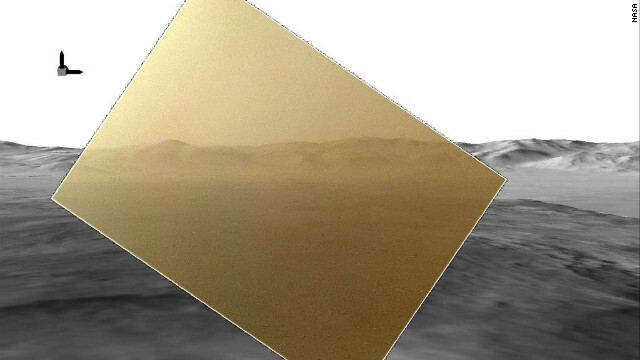 The $2.6 billion rover is on a two-year mission to determine whether Mars ever had an environment capable of supporting life. 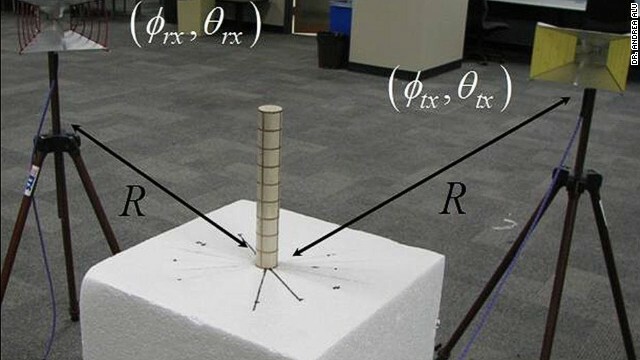 It landed Monday and will spend the next four days installing operational software that will give it full movement and analytic capabilities, scientists said at a news conference at NASA's Jet Propulsion Laboratory in Pasadena, California. Curiosity missed its target entry point into Mars' atmosphere by about only one mile, and most everything in its complicated descent and landing operations - a spectacle popularly known as the "seven minutes of terror" - happened on time, including the deployment of the largest-ever supersonic parachute and the heat shield separation. "From all the data we've received so far, we flew this right down the middle, and it's incredible to work on a plan for (years) and then have things happen ... according to plan," said Steve Sell, who was involved in the powered descent phase. 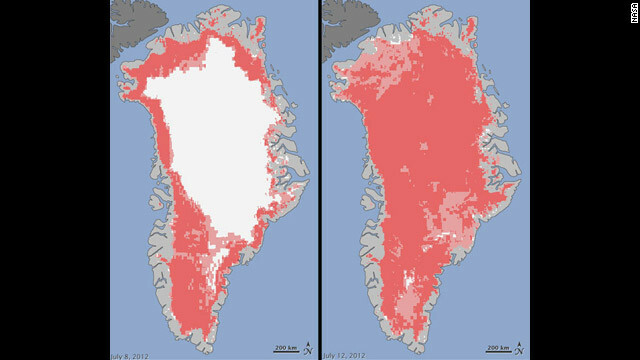 Satellite data show Greenland surface melt on July 8, left, and July 12. "Melt" is dark pink; "probable melt" is light pink. Nearly all of Greenland’s ice cover at least temporarily melted at the surface during an unusually warm stretch in mid-July - a level of melting not seen there in 123 years, NASA said. In an average summer, melting happens on about half of the surface of Greenland’s ice sheet, which covers most of the land and is an average 1 mile thick. But an unusually strong ridge of relatively warm air - hovering just above freezing for several hours at the highest elevation - rapidly accelerated melting this month, and satellites showed that an estimated 97% of the surface had melted at some point by July 12, NASA said. Where this falls in the larger context of Greenland’s changing ice cap - scientists say it is shrinking and causing ocean levels to rise, with warming ocean waters causing ice on the periphery to be lost through melting and rapid flow - is a complicated question, NASA says. 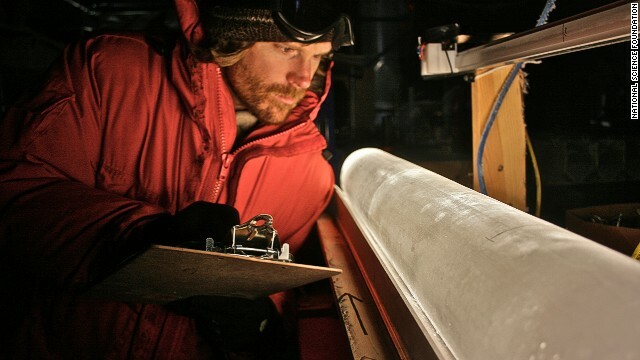 Ice core samples show that the surface melting seen this July happens once in about every 150 years, and the last such melt happened in 1889, NASA said. 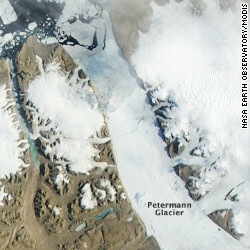 The 59-square-mile ice island that broke off Greenland's Petermann Glacier can be seen at the northern end of the glacier. 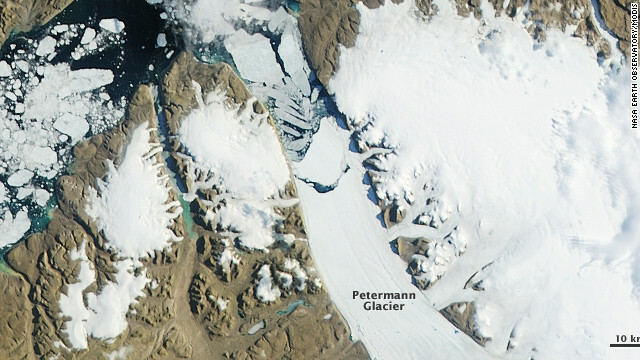 The Petermann Glacier before the ice island broke off this week. An island of ice twice the size of Manhattan broke off this week from a Greenland glacier, a University of Delaware researcher reports. The 59-square-mile (150 square kilometers) iceberg is the second massive loss for the Petermann Glacier in two years, researcher Andreas Muenchow reports. In 2010, an ice island four times the size of Manhattan was lost from the glacier. “While the size is not as spectacular as it was in 2010, the fact that it follows so closely to the 2010 event brings the glacier’s terminus to a location where it has not been for at least 150 years,” Muenchow says in a university press release. The researcher says its too early to blame global warming for the loss of Greenland ice, however. Muenchow says the massive chunk of ice is expected to eventually enter the Nares Strait between Greenland and Canada, where it will break up into smaller icebergs. That could take a while. Pieces of the 2010 calving can still be found along the Canadian coast as far south as Labrador, Muenchow said. Scientists said Wednesday that they had discovered a new particle whose characteristics match those of the Higgs boson, the most sought-after particle in physics, which could help unlock some of the universe's deepest secrets. "We have reached a milestone in our understanding of nature," said Rolf Heuer, the director general of the European Organization for Nuclear Research, which has been carrying out experiments in search of the Higgs boson at the Large Hadron Collider (LHC), the world's largest particle accelerator. "The discovery of a particle consistent with the Higgs boson opens the way to more detailed studies, requiring larger statistics, which will pin down the new particle's properties, and is likely to shed light on other mysteries of our universe," said Heuer. Announcements by scientists about their analysis of data generated by trillions of particle collisions in the LHC drew avid applause at an eagerly awaited seminar in Geneva, Switzerland, on Wednesday. 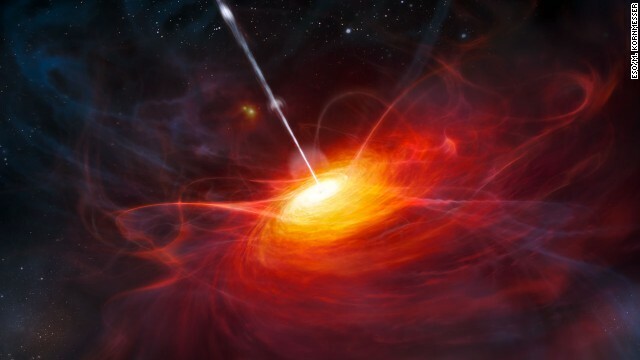 The Swiss presentation comes after researchers in Illinois said earlier this week scientists that they had crept closer to proving that the particle exists but had been unable to reach a definitive conclusion. Finding the Higgs boson would help explain the origin of mass, one of the open questions in physicists' current understanding of the way the universe works. The particle has been so difficult to pin down that the physicist Leon Lederman reportedly wanted to call his book "The Goddamn Particle." But he truncated that epithet to "The God Particle," which may have helped elevate the particle's allure in popular culture. Experts say finding the elusive particle would rank as one of the top scientific achievements of the past 50 years. 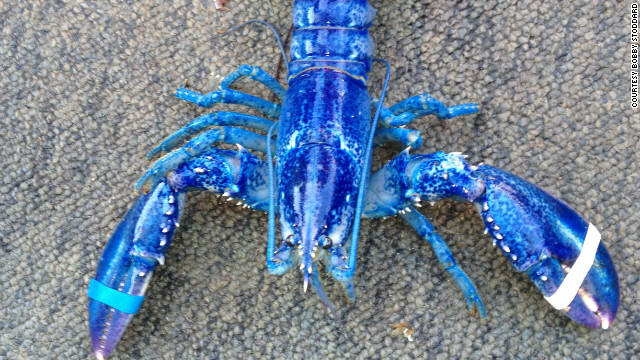 Canadian lobsterman Bobby Stoddard caught this rare blue lobster in early May. He's not sure what to do with it. A rare event is said to happen once in a blue moon. But a blue moon has nothing on a blue lobster. Canadian lobster boat captain Bobby Stoddard said he and his crew were hauling in their lobster traps one day in early May when one of the men called out, "Hey, we got a pretty one in this trap!" "I turned around and said, 'Holy smoke!' " said Stoddard, 51, of Clarks Harbour, Nova Scotia. In the trap with three other, ordinary greenish-brown lobsters was a remarkably bright blue one, the first lobster of that hue Stoddard had seen in his 33 years of fishing for a living. It’s officially a stellar week for Elon Musk, the billionaire engineer behind SpaceX, the company that made history Tuesday launching the first private spacecraft bound for the International Space Station. The rocket, originally set to hit the stratosphere Saturday, might have taken to the sky a few days late, but the excitement Musk expressed on Twitter about the launch extends a victory streak that also includes more earthly passions. 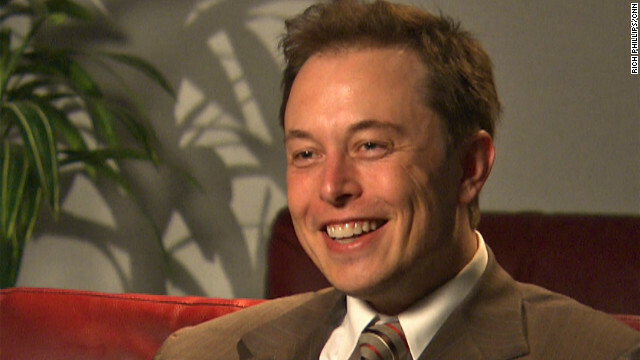 On Monday, Musk tweeted that Tesla – the luxury electric car company he co-founded in Silicon Valley - had reached a “major milestone” by completing crash testing and gaining approval for sale to the public. Seau amassed 1,526 tackles, 56.5 sacks and 18 interceptions in his 20-season career with the Chargers, Patriots and Dolphins. [Updated at 11:06 a.m. ET] The family of former NFL star Junior Seau, who authorities say committed suicide this week, has decided to let researchers study his brain to see whether it was damaged by concussions suffered during his football career, San Diego Chargers chaplain Shawn Mitchell said Friday. Seau was found Wednesday in his Oceanside, California, home with what authorities said was a self-inflicted gunshot wound to the chest. It is not clear if Seau left a note or an explanation. The family made the decision to allow the research in hopes it will help NFL players and others in the future, Mitchell said. 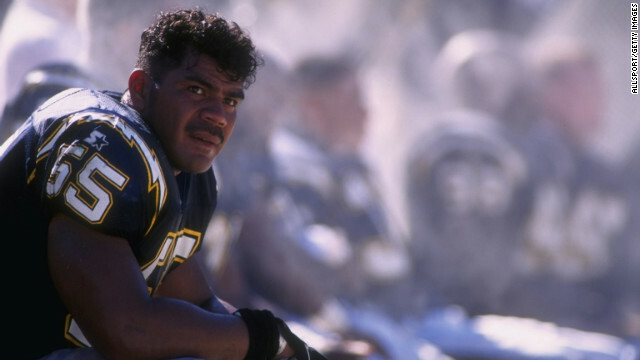 Since news of Seau's death broke, there has been speculation about whether repeated hits to his head over the linebacker's 20-year pro career could be a contributing factor.